A rating on a scale of 1 to 10 given a newborn baby, according to criteria published by the pediatrician Virginia Apgar in 1953.¹ A “10” represents the apparently healthiest baby. In 2006 and again in 2015 the major medical associations that deal with childbirth recommended the use of the expanded Apgar form,⁶ especially in consideration of the original's shortcomings for newborns requiring resuscitation. The expanded form records more data, much of it from more technical analyses, for example, of umbilical arterial blood gas samples. A proposal for a new method of evaluation of the newborn infant. Anaesthesia and Analgesia, volume 32, page 260, (1953). The newborn (Apgar) scoring system. Reflections and advice. Pediatric Clinics North America, vol. 13, no. 3, pages 645-650 (August 1966). 3. In its Manual of Style (9th ed), the American Medical Assn. recommends that the Apgar score be recorded in the form: “Apgar score of 9/10 at 1 and 5 minutes,” (page 444), which eliminates the possibility that someone might think the score was 0.9. J. Butterfield and M. J. Covey. JAMA, volume 181, page 353 (28 July 1962). 5. Virginia Apgar and L. S. James. Further observations on the newborn scoring system. American Journal of the Diseases of Children, volume 104, page 419 (1962). 6. American Academy of Pediatrics Committee on Fetus and Newborn, American College of Obstetricians and Gynecologists Committee on Obstetric Practice. This policy statement is an expansion and reaffirmation of one from the same committees that appeared in Pediatrics, vol 117, no. 4 (April 2006). Brian M. Casey, M.D., Donald D. McIntire, Ph.D., and Kenneth J. Leveno, M.D. The Continuing Value of the Apgar Score for the Assessment of Newborn Infants. The Score. How childbirth went industrial. The New Yorker, October 9, 2006. 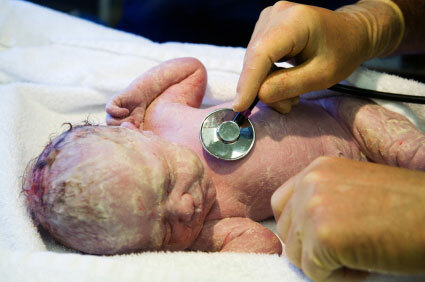 A physician who is a gifted writer describes childbirth. Last revised: 26 September 2018.